A Thank You from Demelza! Home/News/A Thank You from Demelza! 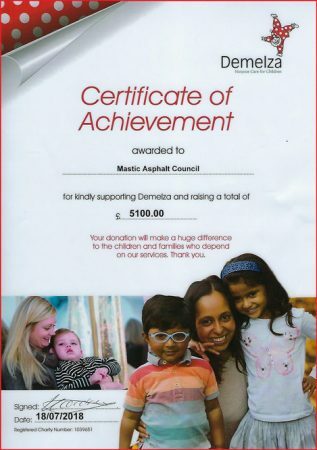 Demelza, the South-East based charity providing hospice care for children, has passed on its thanks to The Mastic Asphalt Council and all of its members for the generous donations received at the recent MAC Awards Luncheon. At the event held in June, MAC members reached deep into their pockets and generously donated a total of £5,100 which has been gratefully received by everyone at Demelza. In addition the Mastic Asphalt Council has been presented with an official certificate of donation, which you can see here on the left. Demelza provides specialist care and emotional support for children with terminal conditions and their loved ones, so they can enjoy time together as family, for as long as they have. Demelza believe that every child and young person who has a terminal condition should receive the care and attention they need to live the most fulfilling life they can, and that they and their families have the opportunity to build memories, for however long they have together. of Mastic Asphalt is Entirely Offset.